Aluminum Handled 70D Squeegee - 16"
This squeegee handle is ergonomically designed and crafted to perfection. This 16" squeegee handle is Ergonomically designed and crafted to perfection. This handle offers printing with either side and is beautifully anodized. 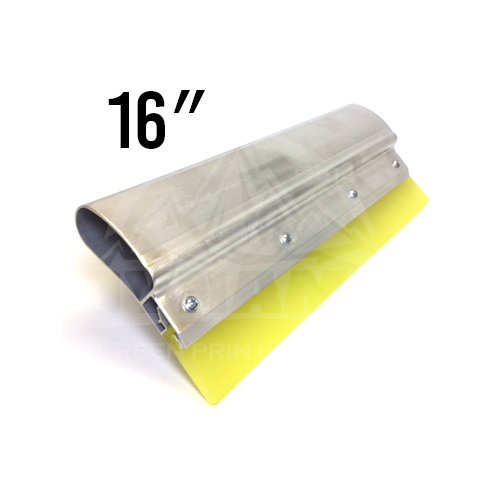 This aluminum screen printing squeegee is cut to popular sizes and assembled with a 70 durometer, yellow squeegee blade. Aluminum Handled 70D Squeegee - 4"
Aluminum Handled 70D Squeegee - 6"
Aluminum Handled 70D Squeegee - 14"
Aluminum Handled 70D Squeegee - 12"